Are you ready for some absolutely delicious fabric choices? Some completely adorable camera accessories? 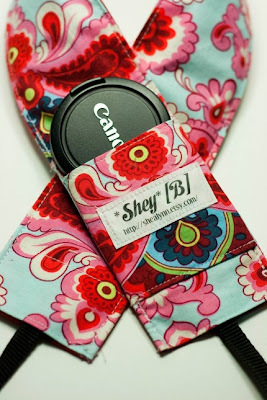 Shealynn from *Shey*[B], has one sassy little Camera Strap shop. Shealynn is an Arizonan mom to 2 little girls and has a love (and knack) for photography. She makes all of her camera straps/covers by hand and ships these little beauties internationally. They do not replace your camera strap, they just cover them up and add the perfect little flair to any camera. 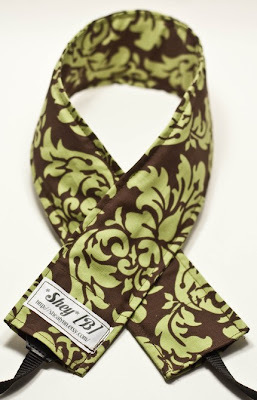 Check out this yummy little Pistachio Damask cover found here. Or how about this Fall Apple Tree cover found here. How sweet is that? Okay, I’ve just about fallen in love with the Pom Pom Flourish cover found here. And something really fabulous that Shealynn has added to some of her covers, is Minky. Have you heard of Minky? Oh, it’s only the softest, most cuddly fabric you will ever find. And she adds it to the back of some of the covers. Perfect for a tired and sensitive neck. Ahhhhh….. 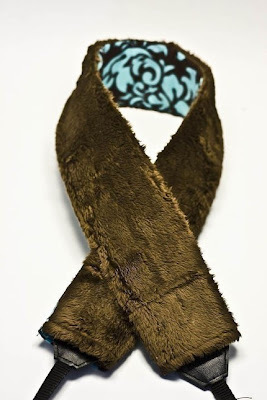 This Turquoise and Brown Damask can be found here. And have you ever lost your camera lens cover? Or just misplaced it? (I have so many times.) Problem solved. Just contact Shealynn if you’d like a lens pocket added to your cover. Shealynn also personalizes the covers, adds fabric Yo-Yo’s to your cover if you’d like, and even offers gift certificates. Wow…..the options. And right now, *Shey*[B] is celebrating her first birthday. Yay. Each week, there will be a new sale offered in the shop. This week, you will reiceve 20% off your order. Check back each week for her new offer. Can’t go wrong with that. And as a side note, go on over to Shealynn’s blog here. You’ll be glad you did. She blogs about life, kids, projects, and more. You will become glued to the screen once you read her posts and see her photographs. So breathtaking. Go on over to www.shealynn.etsy.com and browse around for a while and choose your favorite product. Tell me your choice in your comment. Thanks again for sponsoring Make It and Love It, Shealynn. Your shop is just darling and stocked full of color and perfection. You can find *Shey*[B] on my left sidebar, along with my other talented sponsors. Newest sponsor and a GREAT giveaway!! I love the fabrics that she chooses! Those are darling! I'd love the French Girlie Wallpaper with Minky…so cute! I'm following your blog now, and I added your blog button. Wow, I went to her shop. It would be a tuff decision picking!! I think I like the "Spring flowers came" and the "Jewel Dot", but really, I would love any one of them!! What a hard decision to choose just one. I would love to win the avocado damask cover. I now follow your blog!!! I look at it every day, so I have no idea why I haven't clicked to become a follower earlier!? I follow you officialy now- I always followed on google reader! I love the different fabrics she uses. What a great way to express your personality! I like the Jewel Dot too! the French Girlie is pretty cute! Espresso Damask is pretty too. I love these! I would like to win and give one to my photog cousin. I'm already following and will post about this on my blog. I'm going to grab the button too! These are really cute, I love all of the fabrics. 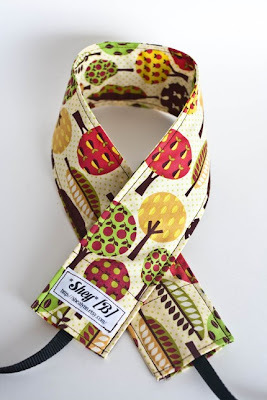 Love that Fall Apple Tree fabric! oh i so need one for my camera! I love them all so much. I hope I win, but would not know which one to choose. I just added your button to my blog also. Yah!! I LOVE these!!! I've been eyeing these for quite some time!!! I love the gothic rose!!! Perfect for my new camera! By the way I was trying to find a skirt pattern in your Etsy shop thats on your blog a few posts back, but I can't find it. Do you take them off after a while? I love the straps with minky! So cute! I love the vibrant paisley. I also love the classic black and white. I really like the new deer one too. I think she is super creative. I am excited about this giveaway! I've been so wanting one of these! what a cute idea! I'd love one. My favorite strap is the lava leaves I think… but its just so hard to choose! p.s. ty for the giveaway! 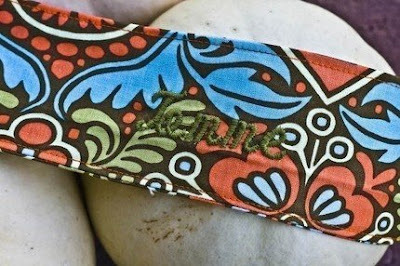 I am an amateur photographer trying to go "pro" and I LOVE these camera strap covers! Esp. the lens cover pocket…I am ALWAYS misplacing mine! Please enter me! Her straps are awesome! I would love to win one and spruce up our boring Cannon strap! I follow your blog through my Google Reader. Love it! PS I forgot my email address on the last one. I love the Moorish Espresso Camera Strap Slipcover because I feel like it something even my husband would like. Not too girly to keep on all the time! Wow. That minky one looks amazing! #1 My two favorites are two that you posted! The Pistachio Damask cover and the Turquoise and Brown Damask cover. #2 My two favorites are two that you posted! The Pistachio Damask cover and the Turquoise and Brown Damask cover. #3 My two favorites are two that you posted! The Pistachio Damask cover and the Turquoise and Brown Damask cover. #4 My two favorites are two that you posted! The Pistachio Damask cover and the Turquoise and Brown Damask cover. #5 My two favorites are two that you posted! The Pistachio Damask cover and the Turquoise and Brown Damask cover. 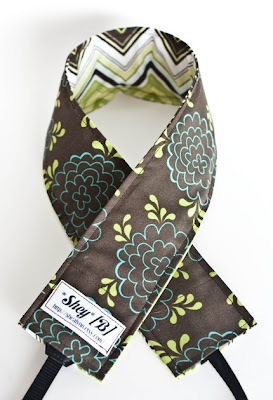 I love the Pom Pom Flourish strap…such pretty colors! I love these straps! And I really need one! Thanks so much for the chance! 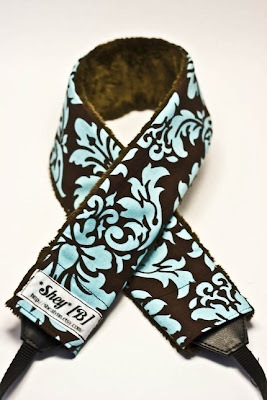 I love love love the Turquoise And Brown Damask strap! Thanks so much!